I dyed a piece of Hoffman PFD (prepared for dyeing) fabric for a whole cloth quilt. This is a very good quality cotton with a lovely hand. The fabric was laid flat on a large table on top of a sheet of plastic. Each of the colours was mixed, and applied individually onto the wet cloth. 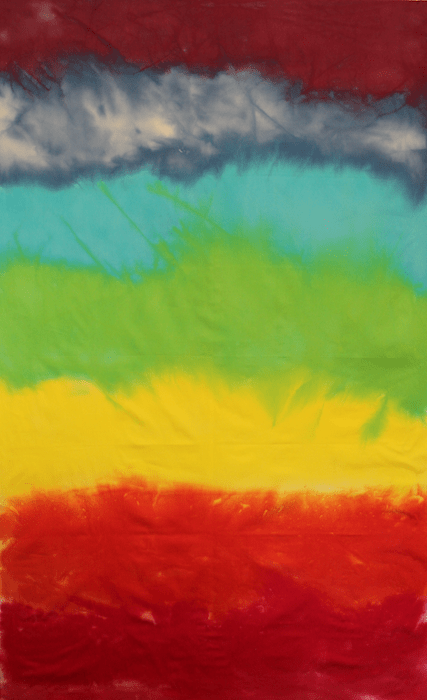 Another sheet of plastic was laid on top and I used a paint roller to spread the dye into the cloth. I left the fabric to cure overnight, then I rinsed it out, washed it and am happy with the results. 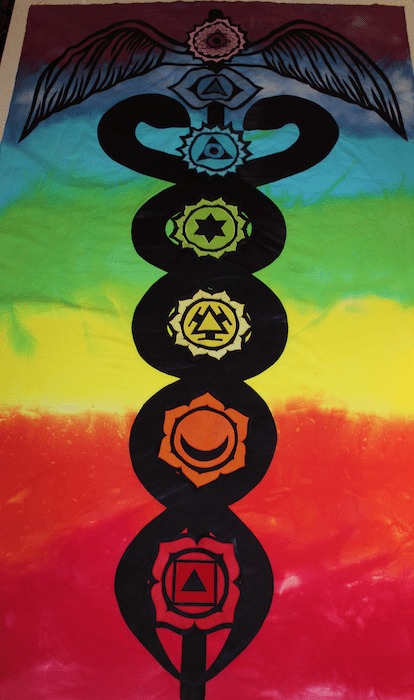 Each of the seven colours on the cloth correspond to one of the seven chakras. 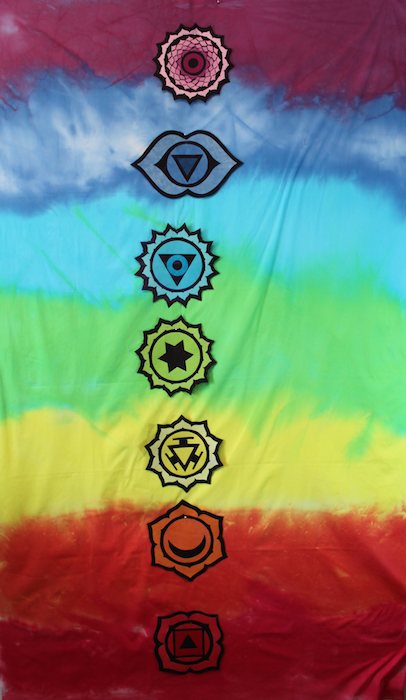 The chakra symbols are constructed from two or more shades of hand dyed cottons. They pieces are cut, fused and satin stitched to the darker piece of fabric by Carol Bryer Fallaert. This fabric by Benartex is called Glacier Park, it is a beautiful deep purple that looks almost black. 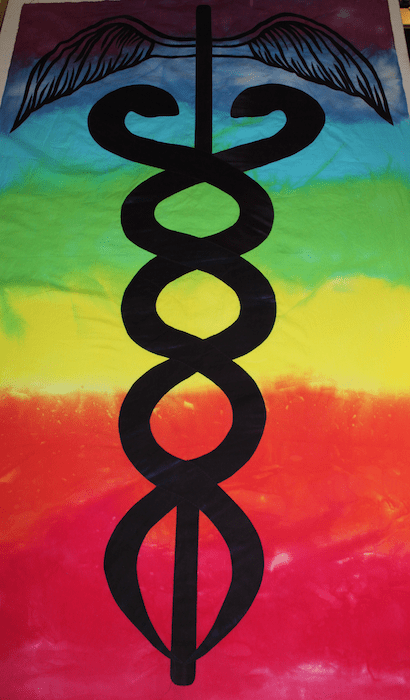 The kundalini serpent below is also made with this gorgeous fabric. This quilt will be the fourth in a series of quilts I’ve created based on the chakra symbols. I hope to enter this piece into the Sacred Threads Exhibition this year. This exhibition occurs every two years and features quilts that are based on “Expressions of Joy, Spirituality, Inspiration, Grief, Healing and Peace/Brotherhood”. My quilt, Radiant Light was accepted into the exhibition in 2013. You can see it as well as a selection of other beautiful and inspirational quilts in the Sacred Threads gallery, as well as the first three of my chakra quilts on my website.